Scruffs' Self Cooling Mat is the best way for hot dogs to chill out in the Summer months. The clever people at Scruffs have filled this bed with a safe, non-toxic gel that starts 5 to 10 degrees cooler than room temperature, and helps cool your canine down for up to one hour - the perfect post-walk way to relax! To reset the cooling mat, just leave it unused for an hour - no need to try finding room between the ice lollies in the freezer! 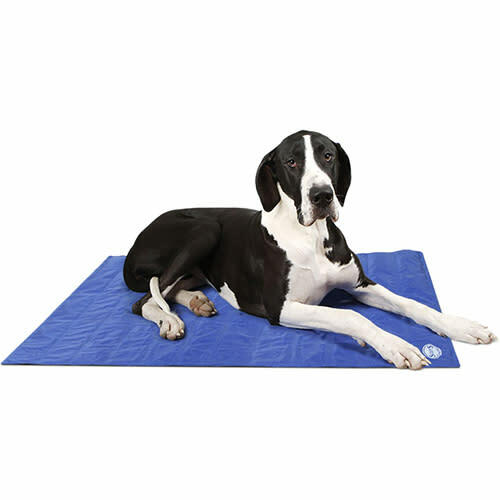 Perfectly suited to use on its own, the cool mat can also be used in your dog's bed or even in a carrier for Summer trips to the beach, and mucky pawprints can be easily wiped clean with soapy water. **PLEASE NOTE: Should you need to return this item, please ensure that it is in the condition it arrived complete with tags and original packaging to be eligible for a full and immediate refund/exchange.